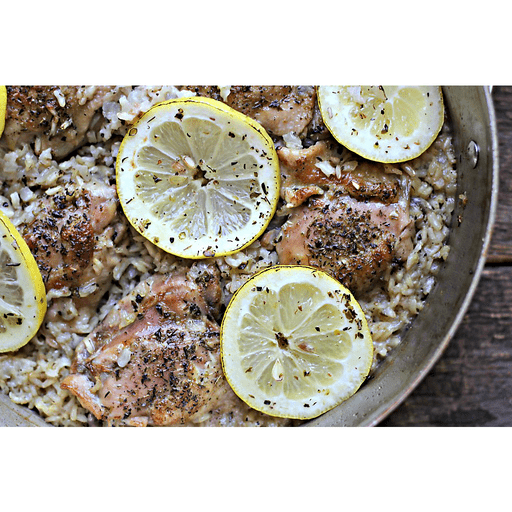 We don’t know if it’s the garlic, oregano and lemon-flavored chicken that give this dish a Greek flair, or if it’s the tender rice that soaks up all these savory flavors, but this dish is everything that dinner should be. 1. Combine the first 5 ingredients in a zip top bag and refrigerate for at least 20 minutes. 1. Preheat oven to 350 degrees. Heat ½ Tbsp. olive oil in a large skillet over medium-high heat. Place the chicken in the skillet (and set aside marinade) and cook, skin side down, until golden brown, then turn and cook the other side until golden brown. Remove the chicken and set aside. 1. Pour off fat from the pan, then return it to the stove. Heat 1 Tbsp. olive oil in the skillet over medium-high heat, then add the onion and saute a few minutes until translucent. Add the remaining rice ingredients and reserved marinade. Let the liquid come to a simmer, then place the chicken on top, then place the lid on the skillet. Bake in the oven for 45-50 minutes. Remove the lid and bake for an additional 10 minutes, or until all of the liquid is absorbed and the rice is tender. 1. Remove from the oven and allow to rest 5-10 minutes before serving. Garnish with optional toppings and serve. Calories 530, Total Fat 36g (Saturated 9g, Trans 0g), Cholesterol 185mg, Sodium 570mg, Total Carbohydrate 17g (Dietary Fiber 3g, Sugars 2g), Protein 34g, Vitamin A 4%, Vitamin C 20%, Calcium 6%, Iron 10% *Nutritional values are an approximation. Actual nutritional values may vary due to preparation techniques, variations related to suppliers, regional and seasonal differences, or rounding.